I want to sell my Thermador electric built in oven, it works and is in good condition except for the clock. It is stainless steel. Does anyone have an idea on what I price I should ask. I would appreciate any opinions. Did you sell it? I actually have one I would like to sell also. I need parts to repair my old Thermador electric oven. If you still have yours for sell I'm interested. I live in Whittier, CA and can be reached by phone (562) 699-0371 or email drewwimon@cs.com. I see it has been awhile, so, does anybody have a heating element receptacle?? The rectangle shaped ceramic box in the back. I have this same exact oven in working condition. We are going to be looking at upgrading this sooner because I need a second rack and just a bit bigger oven for my family. Anyone interested? Do you still have the oven for sale? I would love to buy it. 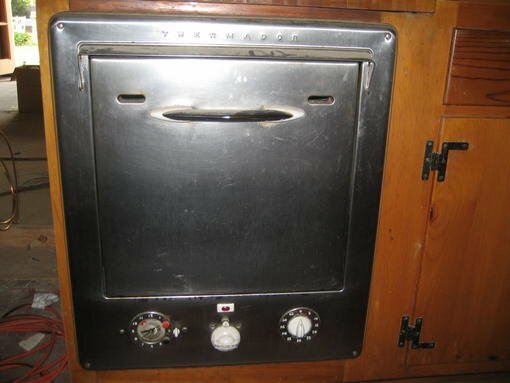 Thermodur wall oven from the 1950's. I have one along with an Thermador electric 4 burner cooktop. if someone is looking for one of this i have one i want to get rid of. I have this oven do you know model number also the timer is super loud does anyone know how to disconnect. Seems like Thermador does havepart or willing to fix these?